There is a two pin terminal block on board that is used to power the device. There is an on board 5v regulator that brings the supply down to a regulated 5v. There are 7x output pins that are discussed in the video above, and in words below. There is also a DC ground pin, and a regulated 5v pin for easy interface with an external circuit. There are also six mounting holes so that you can easily mount this device to your project box. 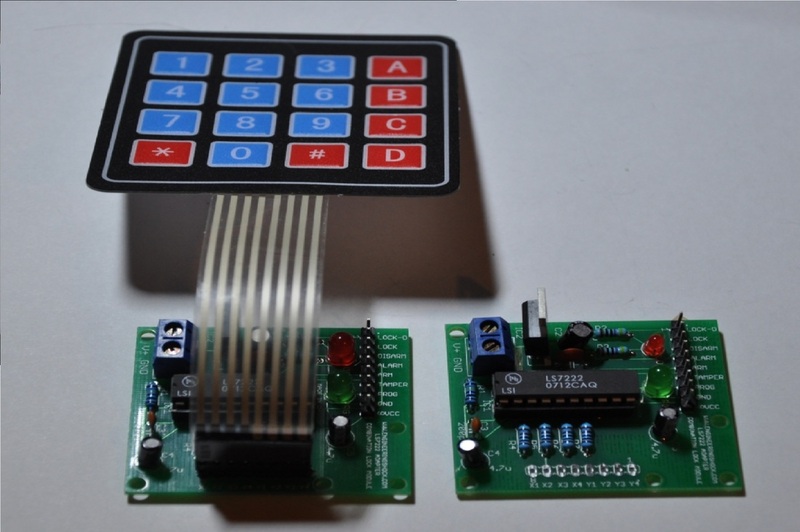 The membrane keypad can be connected and disconnected from the board at any time. It will be shipped to you disconnected, to ensure that no damage has been done. All you need to do it plug it in like I do in the above video. I type "1251**" after power up, and the green PROG LED lights up. I then type "456789", and the green LED turns off. I'm now back in normal mode. My new ARM code is "4567"
My new DISARM code is "4568"
My new DURESS code is "4569"
You see that the first three numbers are common, and the final three digits are used for the final digits on the three new codes. This is all demonstrated in the above video.